Minitokyo »	Saint Seiya Indy Art » Saint Seiya: Esmeralda! I drew it with pencil colors, it took me a while I hope you like it! WOW, really cool art. its so nice, neat and beautiful. it really is lovely. im sure your girlfriend will be flattered with this one. is she here in MT, Norin? the colors are so nice and so are the shadings. i like the girl in there. i thought it was a little pretty ghost but your description helps me in thinking its not it. very pretty and unique. wow, congrats on this one friend. love it so much. Wow, thats bueatifull ^_^ I dont know them but I like your drawing.. How did you color that in? I like it. Good job! Oh, how sweet! I'm sure your sweetheart appreciated the gesture. the pencil medium certainly lends it warmth and texture, a plus in this world of CG doujin. Really nice work. I like the colouring and shading. It looks really great. Fantastic shading work. I really like how use color with colored pencils. Wow!! This drawing is so good and pretty!! ^^ Good job!! You draw very good!! 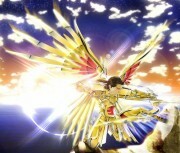 And i luv Saint Seiya!! Well, keep up the good work!! Awww, that's cute ^_^ Love how the colors blend together!! did you draw that yourself? A very interesting subject! was he thinking of the girl? Wow, nice job! You work well with the colored pencils, I would have guessed another medium! O_O The girl looks beautiful. wow...this is really good...nice colours!!! super work!! i like how you shaded everything!! keep it up!!! 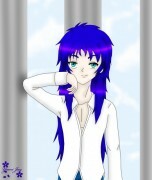 Really colorful drawing of yours... Ehehehe, your gf must have liked it... Ggreat job! Hai! Over and Out! I love the colors in this one. And hey! It's Saint Seiya, retro rocks!!! This is just classic. Awesome job, Norin. I'm sure your gf is very proud of this one. Wowies, what an awesome drawing! You're really talented, Norin! Your colouring is awesome and the shading is really well done! The girls is really cute and I'm sure your girlfriend really loves it!